Our brand, “Homistic” is derivative of the two words Home and Holistic. The term holistic is often referred to as the philosophy of encompassing something as a whole, not just in parts. 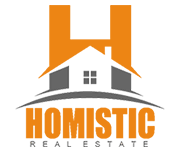 Thus, our brand term “Homistic” simply means that we are focused on your whole real estate experience and that we are dedicated to providing close guidance and personal service through every aspect of your home buying or selling experience. Our logo, which is a combination of two colors, is symbolic of the two words used in our brand. The art of the logo which appears to be a home encompassed by our colors is symbolic of how we embrace your whole real estate experience as described in our brand. We hope that our colors, art, and philosophy will always be associated with our reputation for exceptional customer service, integrity, and your natural choice for years to come.